Store them on your phone within the Gallery app. Transfer them to your PC to your photo album application by sending them with e-mail. Store them on an Internet site, like Picasa or Flickr. Print them from your PC. E-mail or text them to your friends and family. Any combination of the preceding choices. Unlike many regular cellphones with a built-in camera, the Galaxy S 5 makes it easy to access these choices. You need to determine the approach(es) you want to take to keep your images when you want them to stick around. 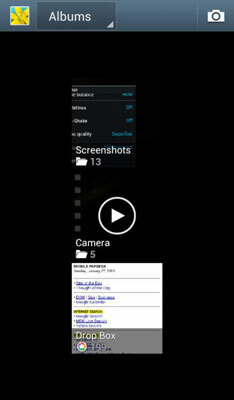 Even though the Camera application and the Gallery application are closely related, they are two separate apps. Be sure that you keep straight which application you want to use. The Gallery Home screen shows how the app first sorts the images on your phone by time depending upon when they originated. All your photos from the Camera app are placed in albums. The application takes a shot at grouping them when a series of pictures or videos are taken about the same time. Not all the images on your phone are keepers. This is particularly true if you’re using the Continuous option to take a quick series of images. When you want to get rid of an image, press and hold the image you want to delete. In a second, an icon appears at the top of the screen in the shape of a trash can. If you want to delete this image, tap Delete. The camera verifies that this is your intent. After you confirm, the image goes away. The Super AMOLED screen on your Galaxy S 5 is a great way to enjoy your photos and share them with family and friends. Depending upon the circumstances, you can view images one at time or as a slideshow. To see one image at a time, just tap that image. See a series of images by tapping Slideshow, which brings up the next image in chronological order, every four seconds. The Slideshow icon is at the top of the image you’re viewing.